The definitive guide to our favorite places for guys to shop in Bangkok. The store is divided into three zones—"The Gentleman, "The Boho Dandy," and "The Urban Lover"—housing Thai brands such as Selvedgework, where you can get a pair of personalized full-selvedge denim jeans; Tuesday Evening, a vintage-style necktie specialist (B990 for tie and pin set). For international brands, you can expect to find France’s Izipizi eyewear (from B1,500 for optical glasses and B1,900 for sunnies). Vintage vinyl records (from B900-B2,500) and coffee table books are also available. There are two menswear stores to check out at Thonglor’s super-stylish lifestyle complex. Rams offers men's accessories, while Toast Bespoke specializes in men’s suits, pant and shirts. Expect one suit to take at least a month, from first visit through cutting, fitting and pick up. At this tiny store below Erawan hotel you’ll find some of the highest-quality off-the-rack suiting we’ve come across in this town (Bote will happily make all adjustments necessary, too). Jackets start around B17,000-18,000. The preppy collections of Oxford button-downs, ties, shorts and accessories are equally worth a look. Meet Bstore’s new shop on Sukhumvit Soi 31. Gone is the Sala Daeng Soi 1 shop-house’s raw, minimal concrete display in favor of an even more minimal bare white interior. The focus is on cult fashion labels from around Europe and Asia, like A Kind of Guise from Germany, Suicoke from Japan and CMMN from Sweden. Grab the cool Art Deco-inspired checked button-down shirt from CMMN (B23,490), a 100-percent cotton T-shirt from Coltesse (B1,695), or the eye-catching Scratch sneakers from Sunnei (B21,500). Unlike Carnival’s other branches, this white-washed venue focuses exclusively on sneakers from Nike, Adidas and Vans, with some special limited editions to soon be available only at this branch. The apparel and accessories shelf also stocks brands like Atmos, Nike and Californian streetwear brand Publish as well as shoe cleaner kits from Jason Markk. The brand started out with menswear during the 1980s before launching its women’s line some 10 years later. Under head designer Bhanu Inkawat, it's become known for modern, minimal wear that blends the line between formal and casual. The signature playful streaks, irregular patterns and unique prints might be too bold for some, but we find every new collection well worth a look. Richly polished Oxfords and tasseled loafers sit alongside supple leather boat shoes in the windows of this subtle but stylish little boutique. All the shoes are both locally made and designed with a clear eye for how men’s shoes should be shaped (no toe-curling winklepickers here). Prices start at around B4,850. Ratchapreuk retro fashion store Me & Sons teamed up with Selektiv multi-label store, formerly of Terminal 21, to launch this space on the top floor of London Brown shoe shop (also well worth a look). The outlet is just the place for gents going for that rugged and unkempt lumberjack look. Expect piles of flannel shirts and backpacks from foreign brands rarely sold in Bangkok like Sugarcane and Heller’s Cafe. Highlight items include Anachronorm's Ana394 Combat Washed Pants (B16,500), Pras Shellcap Lo-Sneakers (B4,890) and Converse Big C FG Slipon in "Olive" (B3,990). These jeans are made only with selvedge denim sourced from Okayama, Japan—“the denim capital of the world”—and handcrafted at their workshop on Sukhumvit Soi 33 using vintage sewing machines. The designs are clean, no-nonsense, but built to last. Due to the close proximity of the workshop, the store also offers alteration services for no additional charge. Prices start from B4,000. Made-to-order start from B6,500 (wait 3-5 days). The fashion boutique section of this popular Ekkamai coffee shop is filled with mostly imported cult brands like Saturdays Surf NYC, Beton x Cire and Stanley & Sons. There's also a room dedicated to vintage-wear brought back from New York. Other highlights include plimsolls from Japanese shoemaker Shoes Like pottery, and accessories from New York menswear label The Hill-Side. A high-end tailor shop-slash-lounge-like men's store from Canada/Finland. Spread over two floors, you’ll find a wide range of ready-to-wear shirts, jeans and leather shoes, as well as accessories like cufflinks, leather belts, ties, socks, pocket squares, bags and wallets. Unlimited consultations with their stylists are also available, while suits and shirts usually take about a week to complete. Tailored shirt prices start from B1,800, custom made jeans from B3,900, and tailor made suits from B11,700. Accessories start from B300. This is one of the rare tailors that Bangkokians love to recommend. The patriarch, Pinky, still rules over his cramped shop packed to the rafters with bolts of cloth. But we like to get sartorial tips from Win, his son, and to go take a peek at the more upscale fabrics in the other shop they operate nearby. As usual with tailors, it’s good to know precisely what you want, although this is one of the safer tailors for the uninitiated. Prices start at around B30,000 for a pure-wool suit. The merchandise team here has curated the very best in emerging Thai talent including cool brands like Container (www.containerbag.net), which produces leather bags for dandy gentlemen, and the funky-yet-classy swimwear of Timo (www.timotrunks.com). Owner/designer Vitchapong “Boom” Hutasuwan will guide you through the process of getting your own custom-made pair of jeans. Choose from a dozen different kinds of selvedge denim either made here or imported from Japan, Italy and the USA, five different cuts (straight to super skinny, stretch or non-stretch) and a wide selection of buttons and add-ons like tailored waistbands, lasered initials and pocket lining. Women’s jeans are also available. Production time is 1-2 weeks at a cost starting from B6,900. Other products in-store include ready-to-wear denim shirts, aprons and imported bags. The 826-sq-meter centerpiece of Central Embassy mall is headlined by menswear collaborations between Siwilai and of-the-moment brands like Kitsune, Globe-Trotter and Orlebar Brown. This is niche luxury retail—don’t go expecting to pick up any bargains. 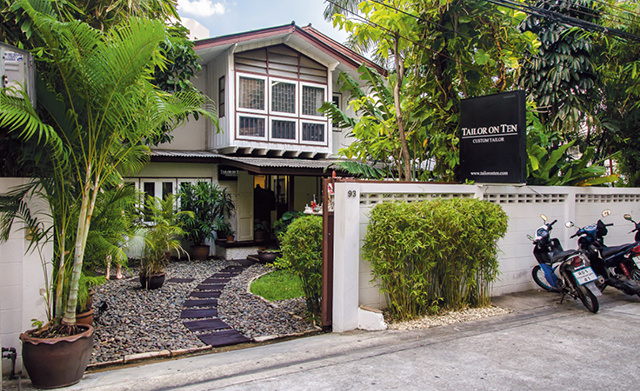 The honest, no-nonsense experience of Tailor on Ten is at odds with many Bangkok tailor experiences: all the prices are fixed, and everyone who works there, from the owners to the salespeople, are very upfront about what they can and can’t do. It’s also one of very few Bangkok tailors which does all its production on-site, and they’ll happily take any customer behind the scenes to see work being carried out on bespoke jackets and shirts. Prices for a suit starts at B18,000 for Australian wool and B23,000 for Italian linen/wool blend. Local brand Viera’s craftsmanship is as European as its name. Their specialty is accessories in flashy, caramac shades of tan leather, be it wallets, messenger bags or boat shoes. Socialite artist Ong Kongpat is a huge fan. The selection of products at this vintage shop reflect its owner's love for vintage Americana. He specializes in men’s products from New York, both new pieces and old stock, with a focus on 20s-70s military-themed apparel like shirts, jackets, leather bags and boots from brands like Ralph Lauren, WRL, Herman, Jong, Converse and Penney’s. Retro graphic T-shirts start from B1,200, while rare pieces like military cowhide jackets go from B1,5000. We particularly like the selection of leather boots, starting from B4,000. This brand's passport wallets in warm shades of leather and suede say well-heeled, creative traveler, while the messenger bags and cross-body briefcases mae for perfectly constructed casual work-wear. Though the look and feel of everything in this cool men's leatherware store might speak of Italy, it is in fact all Thai, which means prices that belie the quality of the products.